We ask the same question today of South African investors, after what has been a challenging battle for returns over the past three years. It is often, but not certain, that investors capitulate at the exact moments when they require fortitude and resolve. Behavioural biases are the primary drivers of capitulation and can wreak havoc on long-term portfolio returns. Therefore, it is vital that as investors we remain vigilantly aware of how ‘animal spirits’ can drive irrational decision making and that we adopt a reasoned framework for investing for our future lives. In South Africa, it has been a tremendous battle for investors over the past three years. In comparison to the previous three-year period, equity returns are substantially lower, which has led to disappointment among many investors. The source of this disappointment could represent a level of behavioural conditioning at play, with investors not achieving the returns anywhere near their expectations – which are often extrapolated using historical returns. In this sense, the recency bias is pertinent. 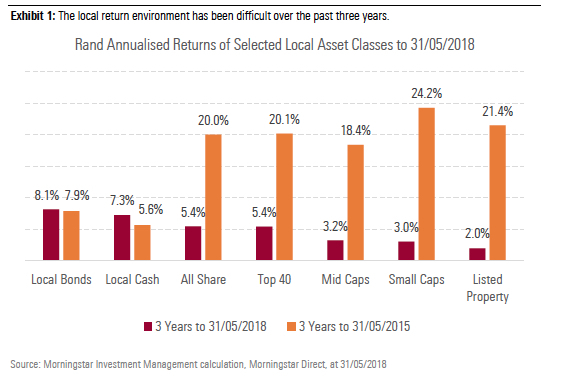 For instance, three years ago a presumptuous investor may have expected say a 15-20% return from investing in local stocks based on the prior three-year return. This use of easily recalled short-term information is a classic error on the part of many investors, which may apply again today for opposing reasons. This time, investors are looking at the most recent period of lean returns and some, with a hindsight bias and the herd mentality at play, are expecting poor returns to persist into the future. In addition, with high cash rates on offer, some will further justify to themselves that reward for risk is not sufficient. This thinking is usually well intentioned, although must be put in perspective. Specifically, we believe it is important to effectively zoom out and consider how risk assets can be expected to perform from current valuations and over the longer term. One means of building this understanding is to look out over longer time horizons, which helps align expectations with actual investor time horizons. Markets will go up and they will go down, of this you can be certain. We all wish we had crystal ball to predict when these gyrations would take place, but in reality, this is an arduous task. Investing, like many things, involves taking the thorns with the roses. 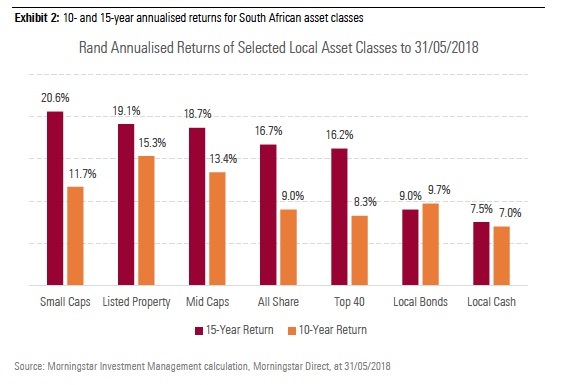 As Exhibit 2 indicates, risk assets have delivered strong returns to investors over the long term – despite the poor performance in recent times. While we are certainly not predicting that this past performance will repeat itself, we think it is important to have context when evaluating opportunities and performance. 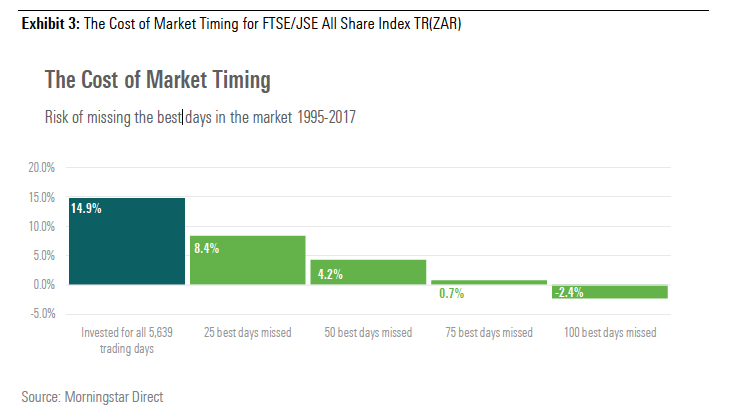 In this respect, investors who had remained invested through a 15-year period (up to 31/05/2018) would have earned a healthy 16.7% per annum from equities (FTSE/JSE All Share TR) despite major market disruptions such as the Global Financial Crisis. By observing the essential characteristics of successful investors, it is clear that patience is a prerequisite. We believe that it is easy for investors to get wound up from a behavioural point of view by placing too much emphasis on macro-economic trends that are often sensationalised by the media to grab readers’ attention. This opens the door for behavioural biases, which can wreak havoc on portfolio returns through emotionally-motivated decisions that are often based on imperfect information. We want to control these biases, maintaining a strong awareness of where they can creep into our portfolios. Our principles guide us along this treacherous path and provide a framework to nullify the potentially damaging effects of focusing on what is beyond our control in portfolios. Instead we choose to focus on what we can control. Underpinning this approach is that investors should not make short-term predictions, thereby avoiding placing too much importance on cyclical behaviour. This type of behaviour is akin to speculation. There are very few, if any, successful investors that have been able to time the market for consistent gain, and often this is linked to what is referred to as the overconfidence bias. We avoid this bias by focusing on the long term and being very aware of the dangers that come from extrapolation. Another method we advocate is to apply a strong fundamental focus throughout the investment process. We should all seek to understand in great depth what the fundamental drivers of returns are within assets and asset classes. Most importantly in this regard is the sustainability of cash-flow growth, which drives present and future valuations.